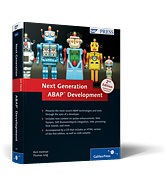 Next Generation ABAP Development is a book designed to keep seasoned developers up-to-date with the latest techniques and technologies available in ABAP. In the second edition of this best-selling title, follow along with a lead ABAP developer as he learns how to assess and employ the new tools and features of ABAP within SAP NetWeaver 7.0 to 7.0 enhancement package 2 (EhP2). You’ll be able to witness the entire process of building applications: design, development, and testing of all areas. In addition, you’ll also become familiar with end-to-end object-oriented design techniques. Keep your ABAP knowledge up-to-date by mastering the new tools and features of ABAP within SAP NetWeaver 7.0 to 7.0 EhP2. Learn about new possibilities in ABAP by exploring example scenarios related to the fictional development project discussed throughout the book. Explore completely new content about ABAP syntax enhancements, Web Dynpro, XML processing,SAP BusinessObjects integration, and more. Find expanded and updated information about ABAP troubleshooting and Web Services. Benefit from a CD that contains code samples and an HTML version of the first edition of this book. Rich Heilman is a senior technical specialist with the EPM RIG at SAP Labs, LLC. He joined SAP in 2007 and had the opportunity to contribute to the development of SAP BusinessObjects Planning & Consolidation for NetWeaver. Thomas Jung is a solution architect on the SAP Technology Solution Management team, focusing on the SAP custom development tools, particularly as they apply to ABAP development or user interface technology.